ACI is your information technology partner, from consultation to onsite hardware, software, and network services. Outsourcing IT and network support can save you time and money. We can show you how. Contact us today for your free assessment or consultation. "ACI is very responsive to our needs. Everything we do is online, and we always receive a prompt callback or email from someone at ACI. Their knowledgeable staff has helped us with major upgrades and minor problems. We would definitely recommend them as a primary business resource." Automation Creations, Inc. provides IT consulting, network solutions, and computer repair and maintenance. In addition to custom website and software development, we can bring additional value to your organization by being a complete technology solution partner. Consultation, strategy, and infrastructure design. Desktop, laptop, and mobile setup and software installation. Firewalls, routers, and virus and malware protection. Networking for everything from printers to servers. Server installation, integration, consolidation, monitoring, virtualization, and hosting. IT continuity planning, data backup, and disaster recovery. Ongoing hardware support and troubleshooting. Our qualified computer and network technicians will work with you to analyze your IT needs, develop solutions, and implement a strategy based on your requirements and budget. Our goal is to be your trusted technology partner. We strive to do this by committing to superior service, leveraging new technologies, and developing strong relationships with our clients. 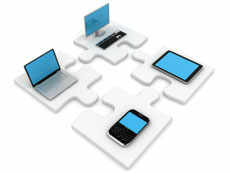 To find out more about our IT solutions and services, please see the other pages in the IT and Network Support section. If you are ready to quit worrying about technology and start concentrating on your business, contact us today for a consultation.